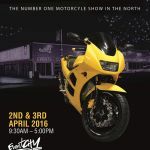 THE BIKER GUIDE® has joined forces with the organiser of the The Manchester Bike Show, to be held on 24th & 25th March 2018 @ EventCity, next to the Trafford Centre, for a competition where you can win one of five sets of tickets (2 of) to visit this show. Held in a 22,000 sqm space, (about the size of four football pitches) and offers you the opportunity to get close up and personal with the hottest new bikes from major manufacturers such as Ducati​, Harley-Davidson​, Honda, Kawasaki, KTM, Royal Enfield, Suzuki, Triumph and Yamaha, see 100's of rare, exotic, modern, classic, custom and Streetfighter machines from clubs and private individuals, thrilling stuntshows, live music, DJ, lots of varied trade stalls, a multitude of guest starts and us - THE BIKER GUIDE ON STAND 419! This years event will have ??? Lots of Motorcycle clubs attending, including BMF, Ducati Owners Club, Gawsworth Jesters, Honda Owners Club Manchester, NABD, Rainy City Harley-Davidson, Royal British Legion Riders and the Chunky Tread Motorcycle Adventure Club​. Clubs and individuals are welcome to display their bikes. Entry forms on the website. price: Pre-book: Adult: £14. OAP: £12. Child (5-14): £4. Two adults & three children: £32. OTD: Adults: £17. OAP: £15. Child (5-14): £4. Two adults & three children: £37. 8/ In some circumstances, where we do not have the prize held @ THE BIKER GUIDE® hq, the prize may come direct from the supplier, organisers and/or from another source such as when another winner cannot attend. We cannot be held responsible for such a prize going astray. 16/ To qualify for entry into the competition to win a BIKERS WELCOME banner, we must have either the event listed with us and/or the Biker Friendly Place sent to us for inclusion (from the owner of said place). These are both free to do, just send the event or Biker Friendly Place details to us via the on-line form. 17/ For facebook competitions that require a like and share, sometimes due to facebook security, we cannot see if a post has been shared. We may in such cases award said prize to someone who has liked the post (which can be seen). 18/ We will always send tickets (or details of how to obtain) them to competition winners, at least 2 weeks prior to the event. When an email is sent and the competition winner has not received said tickets within 7 days of notification, you must contact us within a week as failure to do so may mean tickets are lost and/or we cannot contact the organiser as they are already on site. In such an event, we may not be able to organise replacements.